It stands to reason that because exterior doors are constantly exposed to the elements, they can be affected by changing temperatures and seasonal moisture. While an entry door faces all four seasons of weather on the outside, it endures far different atmospheric pressures on the inside. Whether it’s heat from the sun or cold from an air conditioner, persistent exposure to varying weather conditions and temperatures can take a toll on the functionality of your entry door. Here’s what you need to take into account when choosing your front door. Weather conditions can alter the original colour of your front doors’ paintwork. Continuous exposure to the sun and rain can fade the paint, causing paintwork to lose its lustre and create a chalky appearance. Extreme variations in the temperature can also expand and contract the surface, leading to cracks and chips in the paintwork, as well as increasing the chance of bow, twist or warping of the door. Light reflective paint colours with a light reflectance value (LRV) finish greater than 50 (white – LRV approximately 95, Black – LRV approximately 5) are recommended for Entrance doors to reduce the possibility of bow, twist or warp. Dark colours may void Hume guarantee. If you want your doors’ paintwork to last, make sure to use the right exterior paints for the wooden surface. You’ll also need to consider the weather before undertaking the paint job, it’s recommended to paint when there’s little to no wind, the humidity is low and the temperature is above 10 degrees. Always refer to the paint manufacturers specifications for further details. The elements can also affect different components of the door. No matter how high the quality of timber we use in making the door, regular exposure to the suns UV rays will eventually crack the timber, turn it brittle and break it down as well as increasing the chance of bow, twist or warping of the door. On the other side, too much rain can wear the timber out, this can result in a build-up of moisture, which if left untreated may cause the wood to rot and mould to form. That’s why it’s important to protect your front door from all elements. Variations in the temperature can cause timber door frames to expand or contract. When the temperature increases during summer, you may notice your locks being stuck and may need lubrication to turn. This is because door frames can swell a few millimetres as the temperature warms up. On the contrary, you’re likely to have a hard time locking and unlocking your door during colder winter months. This is because door frames contract when the temperature drops, resulting in a poor fit between the frame and the door itself. The high quality of a Hume door ensures this is minimised, which is why it is vital to choose the right Hume entrance door for your home. Proper maintenance and routine checking is the key to your doors health, check out maintaining your door for tips on regular maintenance guidelines. If you have invested in a stunning front door, then you certainly would want to keep it looking like it did the first time you installed it. 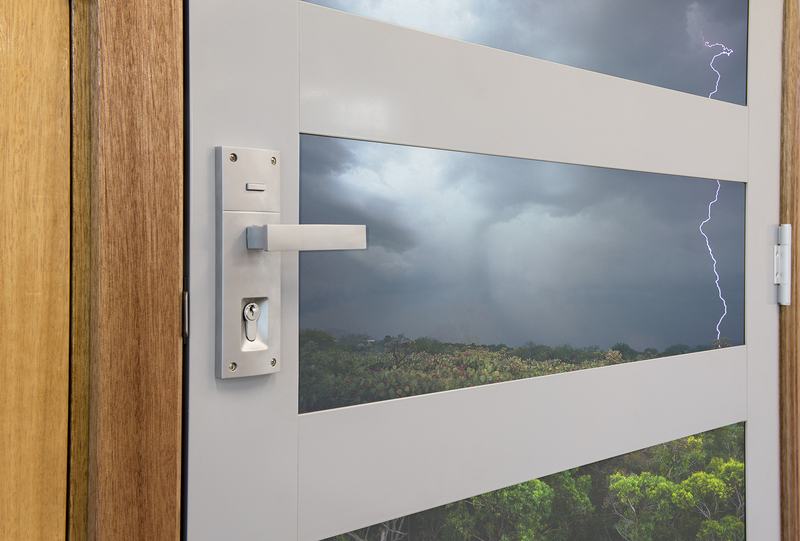 At Hume Doors & Timber, we manufacture customised, durable weather resistant doors so you can enjoy your investment for years to come. We provide information about doors that are best suited to certain areas, for example, doors that are better suited in moisture prone locations or bushfire resistant doors. If you’re looking for quality Australian made exterior doors for a cost-effective price, we recommend you speak to one of our distributors.